The perfect summer companion, Amédée is ready for afternoons spent pool (or pond) –side! Sporting a fresh striped jersey bathing suit that compliments his ducky physique, Amédée the hand puppet is double lined and not the least bit shy about being seen. Your little one will adopt an air of confidence as he brings this puppet to life. Strutting about with his tail feathers wiggling to and fro, Amédée measures 10-inches tall and is the perfect fit for children aged 1+. 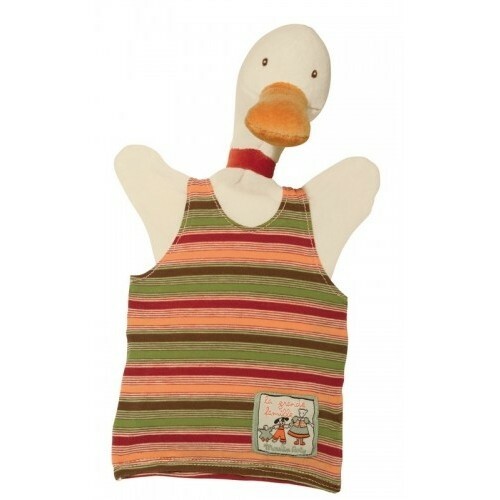 If your little one comes down with a cold or has taken his duck on one too many adventures, don't fret - all of the La Grande Famille puppets are machine washable.